So the week started off on a frenzy and a lot of bile. 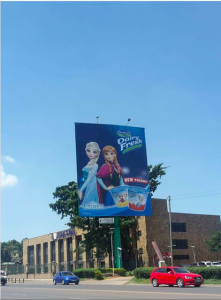 A lot of people got pissed off by this billboard, apparently it was glorifying white characters and asking our kids to watch foreign cartoons instead of our own local heroes. Someone even went as far as making it political. First of all to put it into context, Frozen is the highest grossing animation of all time having been released in 2013, so no one is trying to tell our kids to watch it, chances are they already watched it and loved it. 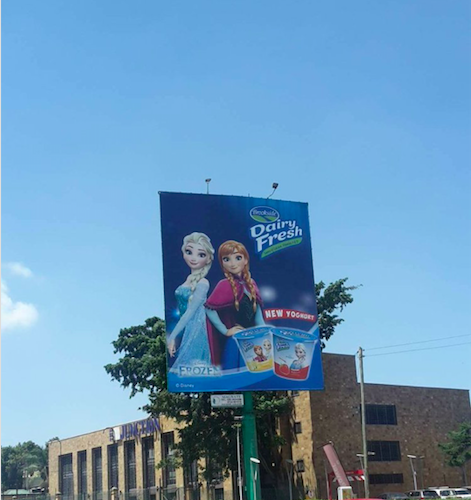 Also, Brookside here did a very clever marketing strategy because they chose those characters that are very popular among kids, Frozen, Sofia the princess (my nieces absolutely love this animation and the Sofia branded yoghurts by extension), Spiderman (for the lil boys), Cars(for the lil boys toy lovers). Don’t take my word for it? Next time you are out for shopping take a lil one, brother, sister, niece, nephew and ask him/her to choose any yoghurt, chances are he/she will pick one of these. Reason being it has one of their favorite characters on it. So anyway, kudos to the creative team at Brookside for this job well done. And the discussions on Twitter although they meant to be negative only helped to amplify this great marketing. Now many more people are familiar with the product, and that is why we advertise!